Bethany’s Music Department is set to host a first-ever on campus high school Honor Band on November 16 and 17, 2018. 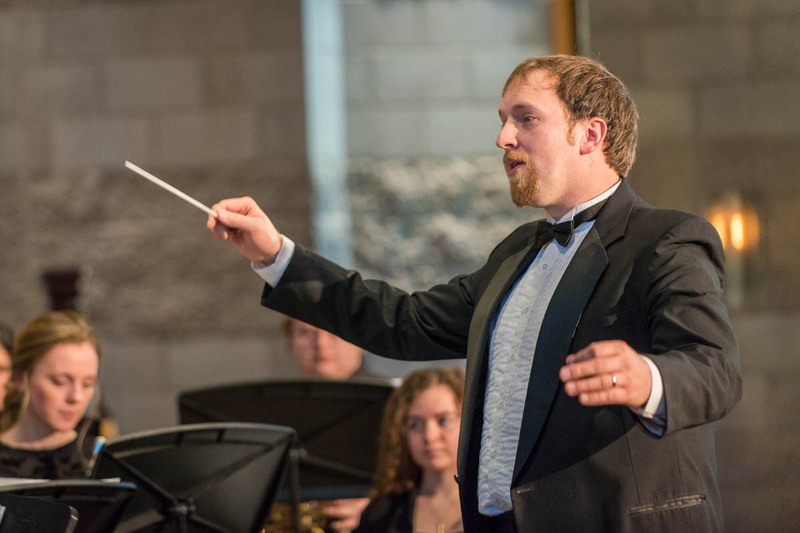 The event is being organized by Assistant Professor of Music Benjamin Faugstad Director of Bands at Bethany with help from Professors Dennis Marzolf and Peter Bloedel, Fine Arts Coordinator Susan Harstad, and Admissions Department representatives Jeff Lemke and Dan Tomhave. The original concept for an honor band event at Bethany was the idea of Marzolf, who has hosted an Honor Choir camp at Bethany every summer for over thirty years. The goal is to allow the high school students to have an immersive musical experience while on campus. They’ll be studying in the Ylvisaker Fine Arts Center, staying on campus with current BLC Students, and performing in Trinity Chapel. The students, from Cleveland (Minn.), Glencoe Silver Lake (Minn.), Lake Crystal Wellcome Memorial (Minn.), Lake Mills (Iowa), Madelia (Minn.), Mankato East and West (Minn.), Northland Lutheran (Wisc. ), South Hardin (Iowa), Saint Peter (Minn.), and Sioux Falls Christian (So.Dak.) are arriving by 2 p.m. on Friday and are wasting no time by jumping in and rehearsing in Trinity Chapel from 3 p.m.- 6 p.m. The music being rehearsed and performed by the Honor Band matches the fall play production of “The Legend of Sleepy Hollow.” After studying and practicing these pieces, the band students will attend the play in the Lee Theater, adding a special element of familiarity with the pieces they are learning to play. Saturday’s events bring another rehearsal in the morning, followed by sectionals in the Ylvisaker Fine Arts Center with Bethany studio instructors. The students will take break from rehearsing for a few hours and enjoy lunch in the Old Main Dining Center, and also have an opportunity to take a campus tour. The afternoon brings one final rehearsal, followed by a public performance in Trinity Chapel at 4 p.m. All are invited to attend the performance.